I know. You might be sick of mock drafts at this point. But with just hours to go until the 2018 NFL draft, it is time for my final thoughts on what to expect Thursday night. One of the overarching questions this draft season has been the idea of “will versus should?” It has most often been applied to Josh Allen, under the guise of “will he go in the top five…and should he?” With that as a backdrop I present my expectations for Thursday night at the quarterback spot, in both what I think “should” happen, and what “will” happen. Wait, your top quarterback is not the first player off the board? Well, everything comes with a caveat that scheme fit matters a ton as well. While I believe that Josh Rosen is the most schematially-diverse quarterback in this class, it does seem that the Browns are down to two quarterbacks in this class: Sam Darnold and Josh Allen. (Unless you believe the last-minute Baker Mayfield chatter). 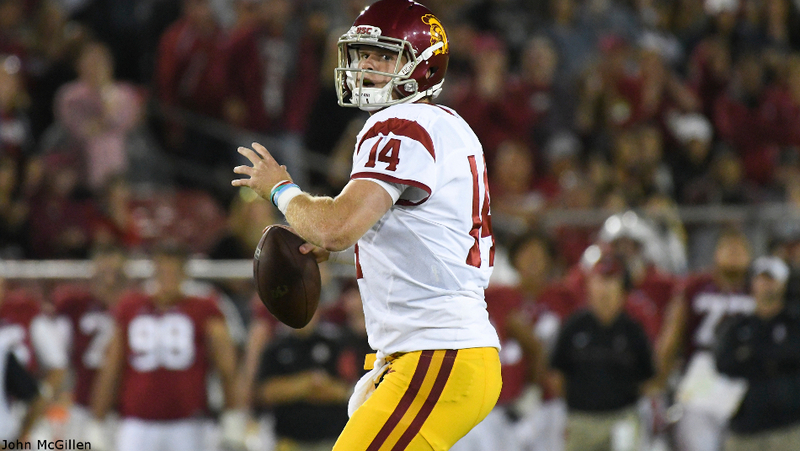 Given that, if it is between Darnold and Allen at first overall, the pick should be Darnold. There is a path to Allen becoming a good quarterback in the NFL but I’m more confident in the marriage of Cleveland and Darnold than in the other option. With Tyrod Taylor in place the Browns have some wiggle room before they have to run their rookie QB out onto the field, and even if pressed into action early, I’m confident in Darnold being able to play through such a situation. I’m not as confident in Allen in that kind of environment. Many people have posited that the draft begins in earnest with the second pick, after the Browns take their quarterback with the first overall selection. The New York Giants could go in one of three possible directions. They could stay and pick a quarterback, although the tea leaves seem to indicate that Darnold would be their preference. They could stay and pick a non-QB, perhaps Saquon Barkley, to try and lengthen the Eli Manning window. Or they could trade back and accumulate more draft capital. That might be the unlikeliest option, given general manager Dave Gettleman’s draft history, but for our purposes here that is the move the Giants make. You can be sure that teams will be calling about that second overall selection, and the Bills can get to two in a package that includes picks 12 and 22 (and probably more than that). So that’s the deal. The Giants slide down and the Bills come up to get Rosen. In my opinion he can come in and probably start right away for Buffalo, in an offense that should be almost perfect for his skill-set. Oh, and we are not done with the Giants. There is real momentum to the idea of Broadway Baker, due in part to Robert Klemko’s series over at MMQB which has followed the Heisman-winning quarterback during the draft process, at the end of which Klemko intimated that Baker to the Jets was a lock. But this fit makes almost too much sense to me. Baker would be an ideal schematic fit for what the Jets did on offense in 2017, which was a hybrid of a West Coast and Air Raid designs. While they have a new offensive coordinator in Jeremy Bates, who is more of a traditional West Coast-influenced coach, there are signs of offensive continuity for the Jets in the year ahead. Under either system, Baker could flourish. I find it hard to believe that Jackson somehow tumbles out of the first round, and with some of the recent reports that the Patriots are interested in him are true, that coupled with the recent glowing reviews on Jackson from former Cardinals’ coach Bruce Arians have me wondering if the league somehow ends up being higher on Jackson than many expected. One of the teams in that mid-range of picks in the first round that could consider a quarterback is the Cardinals, and Jackson might be an ideal schematic fit. Jackson comes from an offense that is rooted in the Erhardt-Perkins system, making the Patriots a potential destination, but he also projects well to a more West Coast-based offense. Well, enter new offensive coordinator Mike McCoy, a chip off the old West Coast coaching block. The Cardinals did add both Sam Bradford and Mike Glennon this offseason but with Bradford’s injury history and Glennon’s…history…the Cardinals would be wise to address quarterback if they can. The two prevailing schools of thought for the Giants this draft are “stay and draft the best non-QB at two” or “stay and draft a quarterback.” However, in this scenario the Giants trade back with the Bills and acquire picks 12 and 22. They can address another position at 12, and here, they address quarterback as well, adding Allen to the mix. The reasoning is for a blend of development and scheme. If you watch the Minnesota Vikings in 2017 under Pat Shurmur this is an offense that still had some of Norv Turner’s influence on it. The Vikings used a lot of play-action, and schemed together a number of deeper passing concepts for Case Keenum off of play-action designs. That fits very well with where Allen is as a quarterback and his prior offensive system in college. Plus, with Eli Manning in place, there is a clear developmental path for Allen. Finally, coming off the board at 22 brings with it a different set of expectations than coming off, say, at 1 or 2, and Allen would certainly benefit from an easier glide path to the starting job. If Mason Rudolph sneaks into the first round, it would mark the first time since 1983 that six quarterbacks were selected in the opening round of the draft. In a vacuum, Rudolph might not seem to be a first-round selection, but there are benefits to Jacksonville getting a quarterback early in this draft. Under his current contract, Blake Bortles accounts for just 4.97% of Jacksonville’s salary cap expenditures. But in 2019 that number jumps to 9.48% as his base salary increases from $5 million in 2018 to $15 million. The Jaguars are becoming competitive right as Bortles’ rookie contract runs out, and his recent three-year extension is back-loaded in terms of dollars, giving the Jaguars some time to work with. But given the strength of this roster, there is an argument to be made that they can stay competitive and make a change at quarterback to a younger, more cost-controlled player before Bortles becomes cost-prohibitive. Enter Rudolph, who would be an ideal schematic fit for a offense that runs the football, uses play-action and incorporates vertical elements into the passing attack. Now that we’ve outlined what, in my opinion, should happen with these quarterbacks, here’s my last guess at what actually does take place Thursday night. The Browns have certainly done their homework on each of these passers, given the rumors that are swirling lately. In the end I think they go with Darnold and bet on his upside, but they do have a developmental plan in place for him with the presence of Taylor on the roster. Broadway Baker. It just feels right. The Bills do make the trade up, but they don’t get to two, instead they come up to five. Gettleman stands pat and addresses a non-QB position, so the Bills execute a trade with the Denver Broncos and pick Allen. Allen does have some elements that could work for the Bills. His size, arm strength and velocity would work well for playing those late fall and early winter games in Buffalo. The team does have A.J. McCarron in place so they could slowly roll Allen into the starting lineup. It would not be my ideal fit schematically, but Allen has shown flashes on tape of making timing, rhythm and anticipation throws. It would not be my choice, but from looking around the league and reading between the lines, it seems like Allen is in play for the Bills. This trade gets it done for them. So the Patriots are a team to consider if Rosen falls, but I’ll believe in Bill Belichick trading up in the first round – to draft a quarterback – when I see it. Therefore, Rosen is still available when the Dolphins are on the clock at 11, and for a team facing some questions at the quarterback spot, Rosen would make sense. Adam Gase has been linked to some of the top quarterbacks in this draft including Rosen, with the Miami Herald going as far to report that the coach is “obsessed” with the UCLA product. If Rosen is there at 11, and he very well might be, I doubt he is still there at 12. This marriage makes too much sense to me. With two quarterbacks in place, the Cardinals can take their time inserting Jackson into the lineup, but with some question marks throughout the roster Jackson is the type of electric athlete – and quarterback – who can mask deficiencies on the rest of the roster while they rebuild. As for the Rudolph-New York connection, the Giants did meet with Rudolph at his Pro Day, and he would be a decent fit for what I expect the New York offense to look like in the year ahead (as discussed in the Allen section). Plus, getting Rudolph in under a rookie deal, witih a team option for a fifth season, has some value as well. Follow @MarkSchofield on Twitter. Buy his book, 17 Drives. Check out all his work here, like his piece on RPOs as the next evolution of the hi-low concept and Deshaun Watson’s processing speed.